To have your housing lot included in this new RP add-on, fill out the form located at http://goo.gl/forms/hhCPL6G0cs and provide your details. Some of you may remember the addon I made for Mira's Anchorage. It was really useful for getting around the neighborhood. What I'd like to propose is a similar housing directory for WSRP users. You guys have compiled in the Entity and Jabbit forums, a great list of housing and descriptions. What I'm proposing is an addon to basically bring them in game, for easy visiting. Your faction and realm will be automatically detected and the correct directory listing loaded. The UI will come in as you see on the left initially. 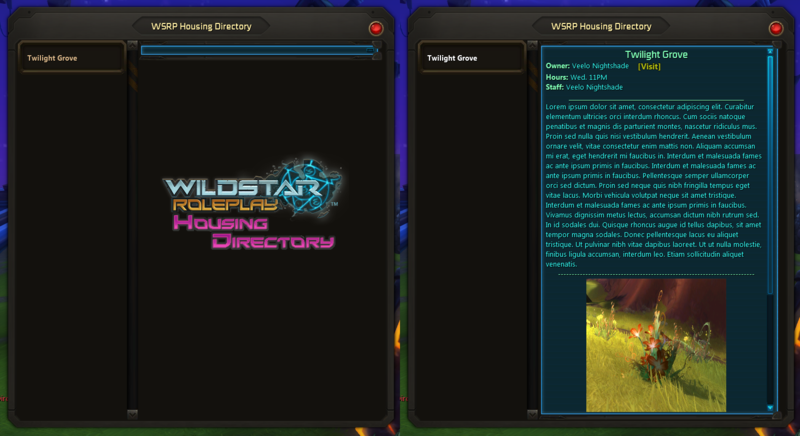 Upon selection of a housing location in the left column, the logo will hide and the hologram area will expand downwards. By default it will animate. I will add a switch for removing this, but it adds a little pizazz to a boring addon. The user who enters will need to supply an email address to get a confirmation email and link to edit their submission in the future. Looks like an interesting idea. Not sure the Staff list is going to be particularly useful - not every plot is a business - perhaps replace it with a notes section (For stuff that wouldn't work in the description) and a staff list can be put in there if applicable. 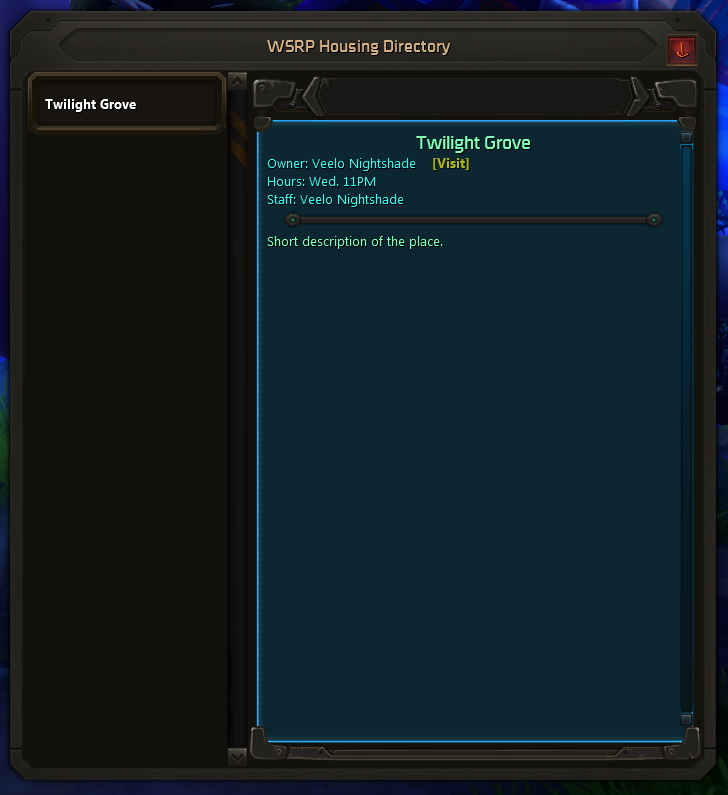 Currently, my plot would be given the description of "Bar and gathering area for the Flickerwisp Aurin community". The Staff list would be "Tevratt Ceruleanmist plus volunteers"
A notes section I'd be able to have a staff list, as well as notes such as "Hatch to hangar and top floors of the house are kept locked. Aurin community focused events occur on X day so bar will be closed"
I think an addon like this would work quite well, though making it as easy as possible to enter data in-game would probably be better, even if it means leaving out the screenshots. You can always leave a field blank. I put staff up there for gather places so that people can know who to look for online if something's' going on there. By having the staff list, I can actually let the addon check to see if any of those people are online. Stuff like locked doors can be put in the description section. so that means, you could even go an extra step and place a little marker above staff character's heads or something like that...? I know Revisit, but I'm looking to do something fancier, more akin to a phone book kind of thing than just quick visiting. Something we can recommend to newbies who don't know where to go yet. I like the idea of this, and i liked the visual map thing that you had done with Mira's Anchorage (here's a video of it in use, if this is the same add-on you are talking about (link jumps to 5:40 mark). If not, then never mind! I'd be glad to help with data entry! On a related note, I've been starting to hunt for an external events system that I can pull into the site in an iframe. My tests are looking positive, so this opens up some possibilities for data entry and integration. Yep, that's the one. This'll work similar, sans map. So, what I need enxt is help with the color selection for the window. The addon currently checks you server and faction, and then loads the appropriate directory file. When you click visit it now takes you to the place. When you click a staff member name, it does a /who for them.